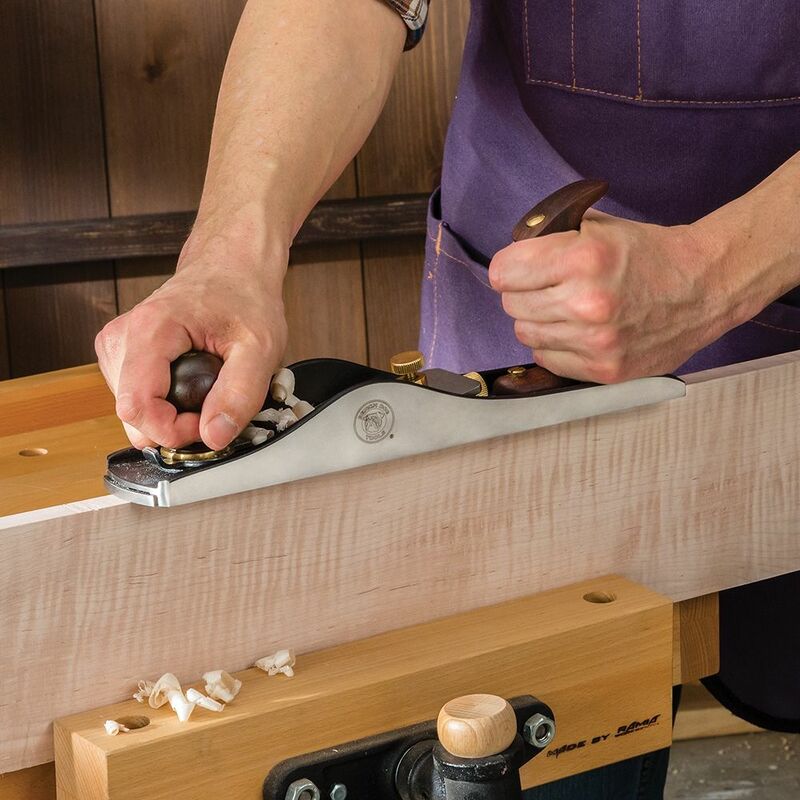 A low bedding angle and adjustable mouth let you take the aggressive cuts of a jack plane and the fine shavings of a smooth plane. Bench Dog's No. 62 Low Angle Jack Plane is among the most versatile planes available. Thanks to its adjustable mouth, it can take rough surfacing cuts and fine smoothing cuts equally in stride. The 25° blade is set bevel-up at a low bedding angle of 12°, creating a total effective angle of 37°. This low attack angle slices through difficult grain, including end grain. The blade is exceptionally thick for chatter-free planing. 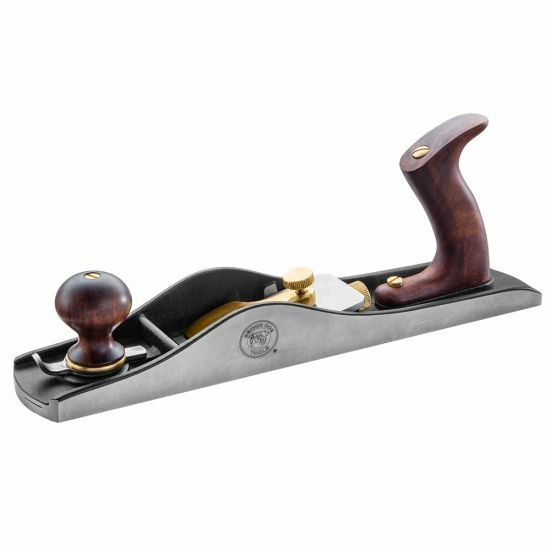 Quality materials, precision machining and solid construction result in a hand plane that's an absolute pleasure to use. The sole is precision ground flat. 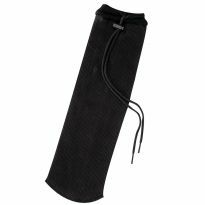 The blade is made from thick 3/16'' hardened carbon steel for reduced chatter and excellent edge retention. Solid sapele is used for the comfortable tote and knob, adding a touch of elegance. 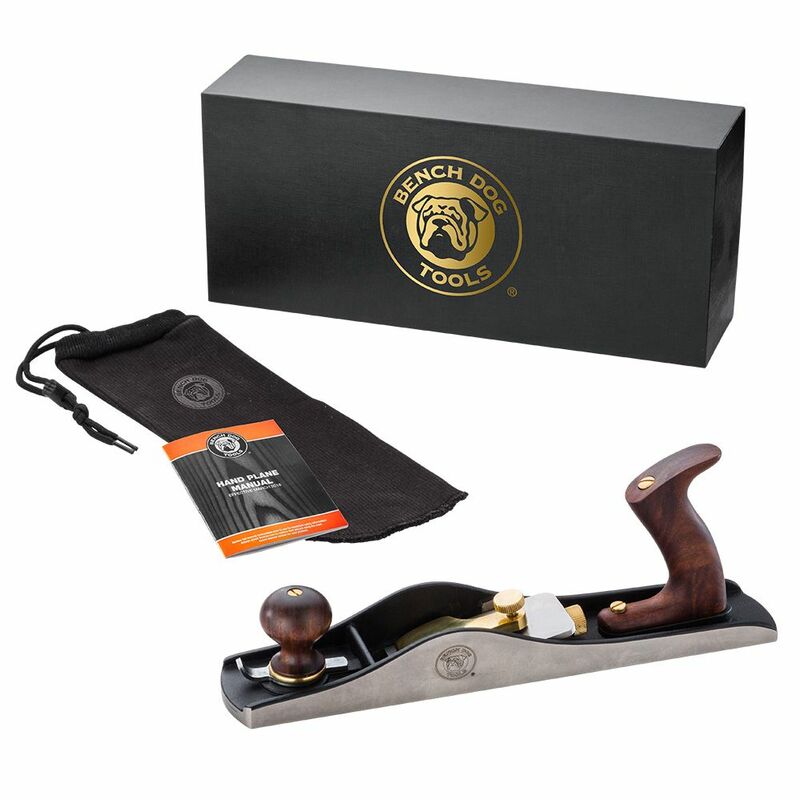 Each plane includes a case, sock, manual and a Certificate of Inspection with measurements specific to your plane for sole flatness and blade hardness. Would, actually have, purchased more bench dog players since this one. Took me a minute to get used to it, but one I did, I’ve really enjoyed this plane. It’s sturdy and well built. 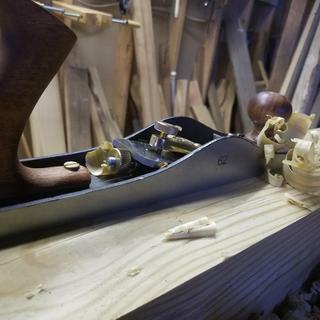 I started using a hand plane after my power bench plane stopped working and to avoid making noise and use so much power. I found this one was an awesome plane and worth every penny on the tag. Next, I am getting Hand Plane Jointer - no. 7. Although made in India, the quality is exceptional. The extra thick blade is appreciated. It is half the price of a Lie-Nielson, but does the same job very well. Waited a long time to pick one up. Loving it. I was very pleased with the quality of this item...it is well made. I haven't got to use it much yet, but I did find the blade adjustment difficult to get to. This is inherent with the design of the tool, otherwise I am pleased so far. I recently took delivery of this item after ordering it during a 20% off sale. I don't use hand tools too often, so I thought I might try and save a few dollars with a new brand/product. As always, Rockler's customer service is EXCELLENT. 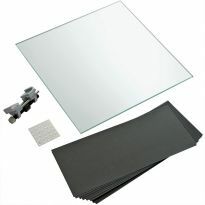 My order was processed and shipped promptly; moreover, my concerns and issue were addressed and resolved without delay. I've given this review a 3-star rating because the item that arrived in my package was blemished with scratches on both sides. 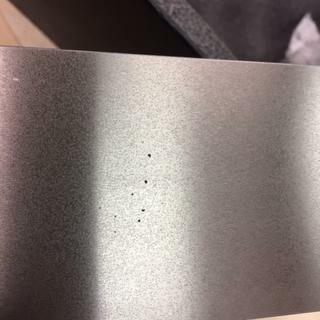 While these scratches should not affect the overall performance of the plane - and I'm sure I would add my own scratches over time with use - I was dissapointed to find them on a brand new item. Additionally, the product description quotes a sole flatness tolerance between 0.0015" and 0.002". 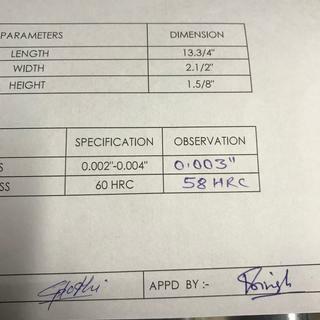 However, the included paperwork quoted a range of 0.002" and 0.004" with mine registering at 0.003. I know these are all very tight tolerances, but the item is not as described and (as of this review) the product description remains. The included blade looks great. I have no doubt that this plane will would have performed well and I encourage those looking for a good quality plane at a lesser price than those of LN or LV to seriously consider these. That being said, expectations for "out of the box" quality need to be aligned accordingly. This is a beautiful plane that was made in India. Well within the specifications listed here, but does not match the advertised description. I was getting really frustrated trying to get it to cut correctly. Then I checked to see if the blade was square. Not so much (see pictures). That said, Rockler's customer service was great, and they're sending me a new blade. I'll update my review from a 3-star to 4-star if it works when I get it. Finally an affordable plane, but very disappointed after opening it. Large imbedded unremovable thumbprint on the gold portion. After removing grease from the sides with mineral spirits, there appeared a brownish stain that would not polish off. Bench Dog quality control was not up to par. Hopefully other units are not like this . . . . even at sale prices. I was also curious why this unit was shipped to me from the return center???? Has it already been returned by another buyer? 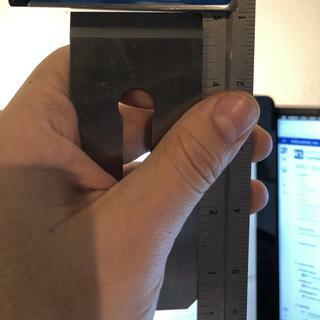 Rockler refunded my purchase but it still cost me $14 postage. I saw it at a Knife Making Workshop, was impressed, 20% off, ring it up! I am a member of The Hand Tool School in Maryland and was recommended to Rockler for good quality hand tools. Always wanted this plane, so when it went on sale, I got it. The description says the blade is hardened carbon steel. Is this O1 or A2 steel? Is there a toothed blade for this plane? I just received mine and I can’t get it to cut. No matter how far open I have the mouth, I can’t get the blade down far enough to protrude past the sole. Did anyone else have this problem? Or is it something I’m doing wrong? BEST ANSWER: The adjustable mouth on mine is not very useful. 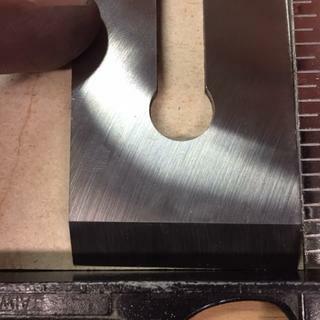 With the mouth all the way open there is only a little over a 1/16 opening when it begins to cut. If the bed of the blade is out of tolerance I could see where there wouldn't be enough room to get the blade out before hitting the mouth. 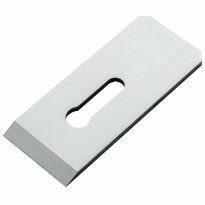 It would be difficult to use mine with a scrub plane blade configuration because the mouth won't open large enough. Also, I sent my first one back because the blade bed was out of square and would not cut evenly side to side no matter what. Opening and closing the mouth is a function of how thin a shaving you want, it doesn't move the iron down into the path of the wood. Rotating the round screw (rotating adjusting nut) right in front of the handle (tote) will lower the blade (iron). 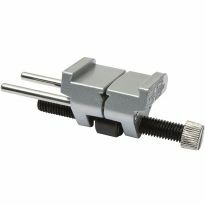 You may have to loosen the screw (chip iron thumbscrew) slightly for everything to move. The mouth has nothing to do with depth. You need to undo lever on the blade and turn the knob at the back of the blade. Then push lever back down to secure blade. No, the bevel is up. If I had it upside down the slot wouldn’t fit in the thumb adjustment screw.